There is nothing better than getting a new puppy. They are so cute and cuddly, RIGHT???? OMG!! Puppies are so much work!! I forgot that they chew things. I’ve been really lucky over the last month to only lose two phone charger cords. So it hasn’t been too bad! Well all that has changed. Cooper took a liking to my glasses. I guess it’s time to get some new ones!! I’m really sad because these were my first pair of glasses. Instead of going with the 2 for $100 deal, I had decided to pay the extra money for designer ones. I LOVED my Burberry glasses and wanted to just change out the lenses when I got a new prescription. Do you think these can be saved!!?? I have an eye appointment set for next week. In the mean time, I’ve been squinting to read everything. By the end of each day I have such a headache! I can’t wait to get a new pair!!! Have you tried the cheap reading glasses in the meantime? You can actually find some pretty cute ones! My first 2 prescriptions were the same as readers. Both mine and Johnny's glasses took a week to get it after we ordered them! The glasses look like you can get them fixed. Take them back to the company you bought them from and give it a try. 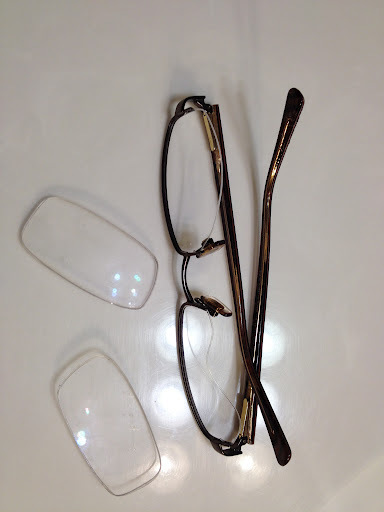 I have had glasses fixed that were in worse shape than what I think I see. I still say the pup did the damage because you did not choose Shasta as the name.